Lately my kids have been interested in Super Heroes. My kids can list off a huge list of them (some that I had to verify were real ones like Dr. Octopus, or something like that.) 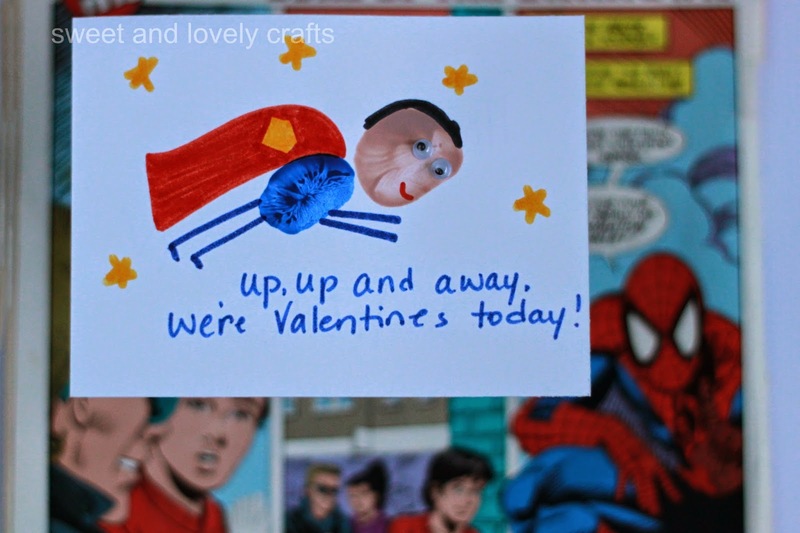 So I thought that it would be cute if we made Superman valentines. Simon helped me make these since Claire was at school and I think that he did a great job. 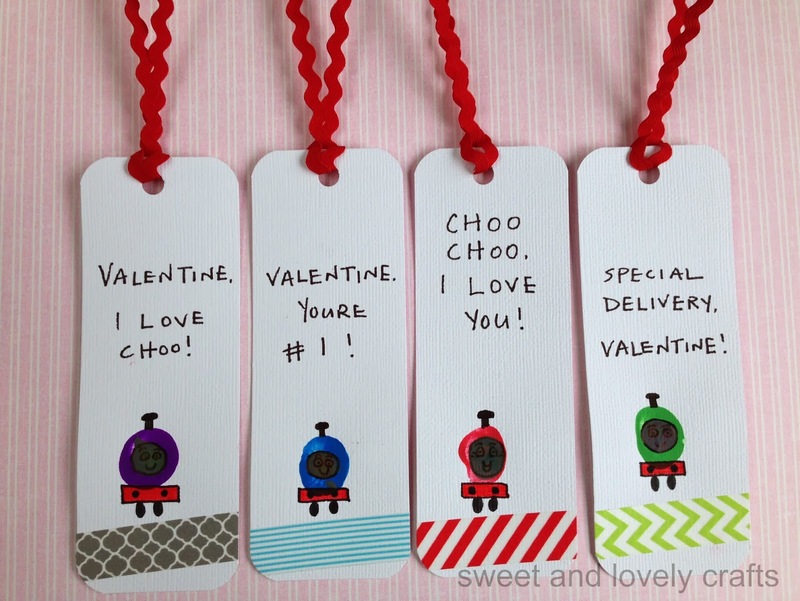 I'm hosting a little play date for Simon and his friends the day before Valentine's day (while Claire's at school celebrating) and I thought these would be perfect for him to give to his friends. I cut the paper into rectangles measuring 3x4inches. Simon dipped his thumb into the cream(ish) colour paint and pressed it firmly onto the card. He did all of the cream coloured thumbprints and then did all of the blue ones right next to them. Once the paint was dry I used the markers to finish embellishing the cards. I used the blue to draw the arms and legs and black for the hair. (Yes, I'm aware that there will come a point where my children far surpass my artistic (ha!) abilities.) Then I used the red marker to draw a smile and a the outline of the cape. I used the yellow marker to draw a diamond like shape on the cape which I coloured in yellow. Then I finished colouring in the cape. I added a few stars as well. To finish Superman I glued on some small googly eyes. Then I tried to think of something clever to write on the valentine. 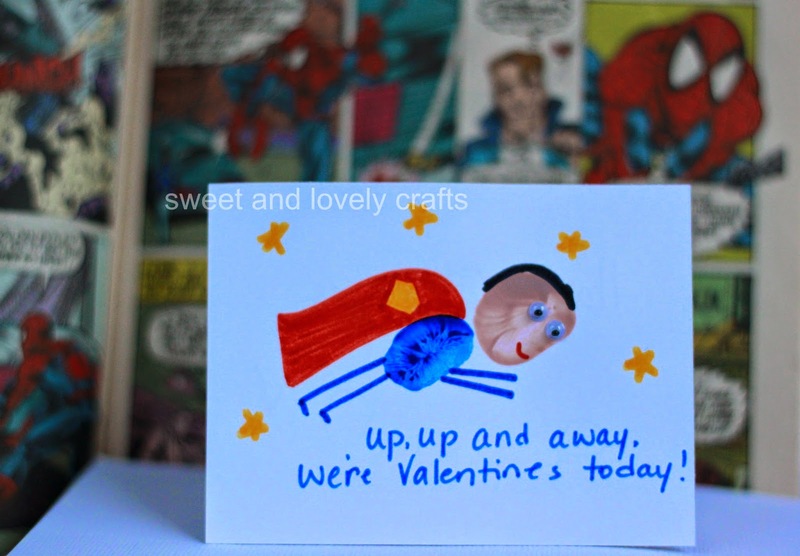 I googled Superman's catch phrases, but Superman didn't give me much to work with :) He does say up, up and away, hence the use of that on the card. 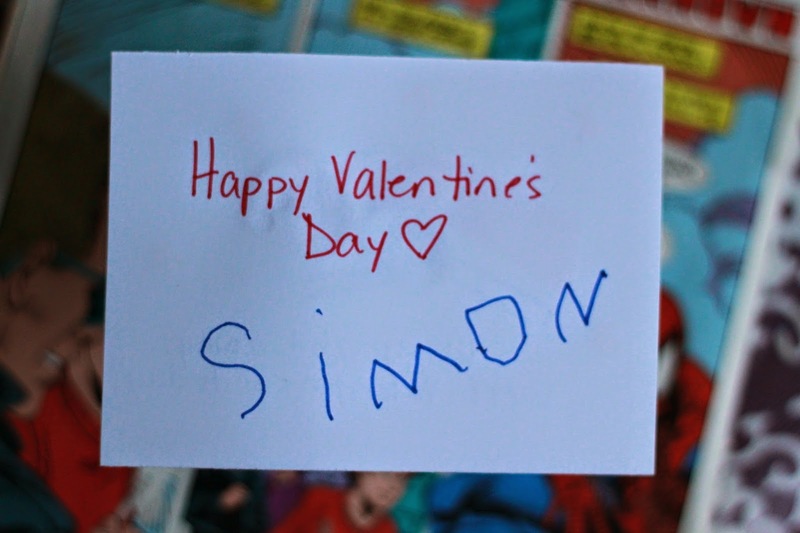 Simon signed all of his cards and now they're ready for him to pass out to his friends, so that when his sister comes home with a bag of valentines, he will also have one! 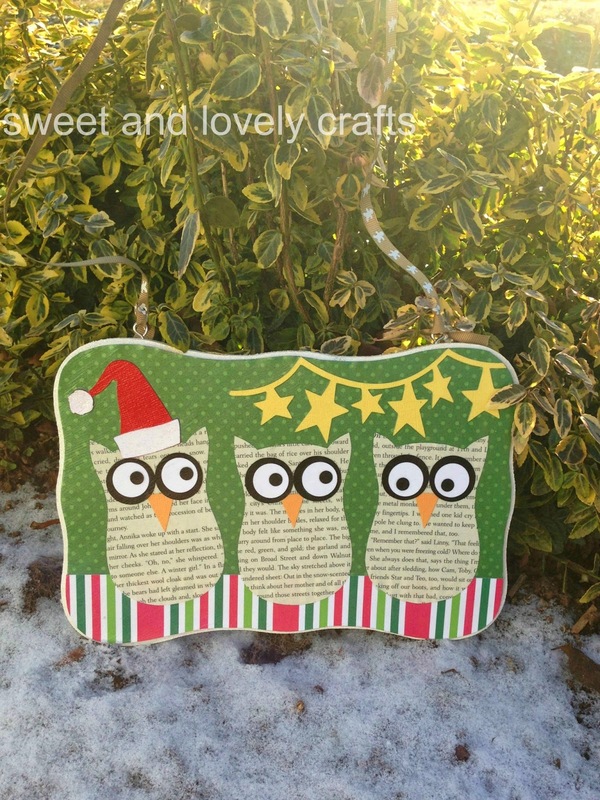 I saw this craft on my Pinterest strolls in October and loved it so much that I was inspired to make an owl themed Christmas sign. I love these wooden signs from the dollar store- I've made a few different ones in the past, but this one is my favorite. I started by painting the edge of the sign white. I debated leaving it unpainted but thought this would give it a more finished look. After I cut out the paper I mod podged it to the sign. Squeeze out all the air bubbles. I mod podged the accent piece of stripped paper on at this time too. Then I created an owl pattern and traced cut the owls out from pages of an old book. I cut out the circles for the eyes, using my hole puncher to cut out the smallest circle. Then I cut a small triangle out of orange paper for the beak of the owls. I glued the eyes together and then glued the eyes and beaks to the owl cut outs. I used my cricut to cut out a little Santa hat for one of the owls. I also cut out a little star banner. 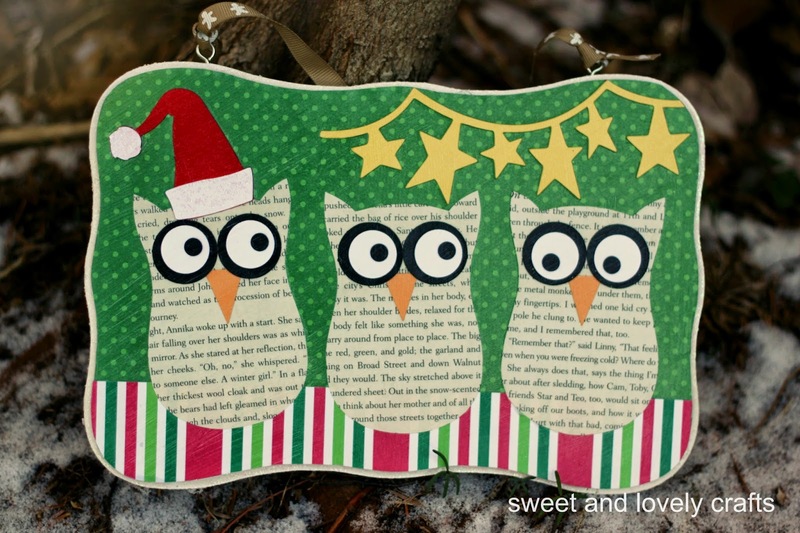 Then I glued the owls in place (using Mod Podge). I added on the accents, hat and stars, and then painted over everything with a nice layer of Mod Podge. To finish my sign I added a cute little gingerbread ribbon so that I could hang it up. Is everyone else in full on Christmas mode yet? I'm almost done my Christmas shopping, just have to pick up a few stocking stuffers for the kids! My kids are getting so excited for Easter. At six years old I'm surprised that Claire has already figured out that I'm the Easter Bunny, but she still expects a little egg hunt this year! 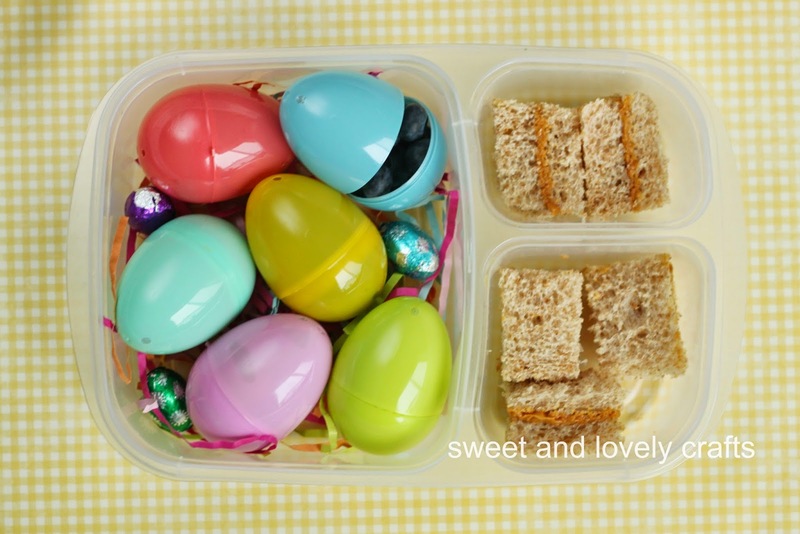 I've made a few Easter lunches for Claire which she has really been enjoying. I made a Wowbutter sandwich on some oatmeal brown bread that I made. 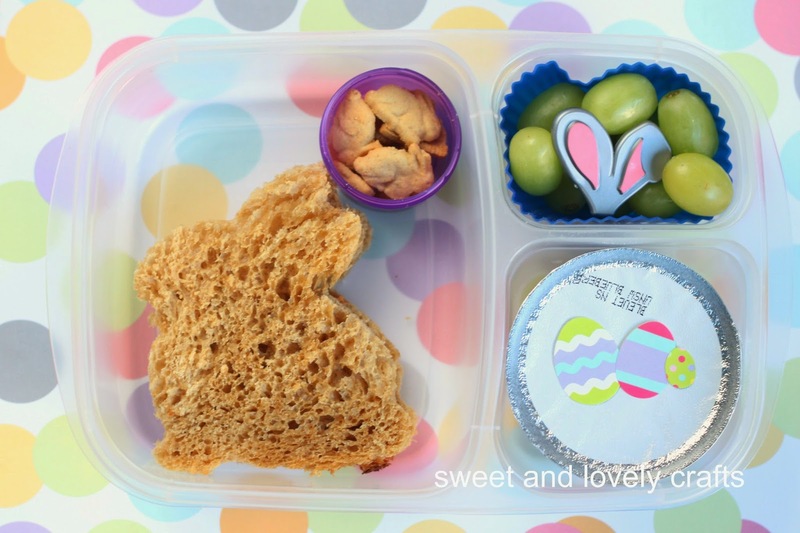 I added an Easter sticker to the top of her applesauce, a bunny ring to her container of grapes and some Annie's bunny crackers for a snack. I picked up this new bunny cutter this year at Target (love that Target's in Canada now!) complete with a bunny tail. 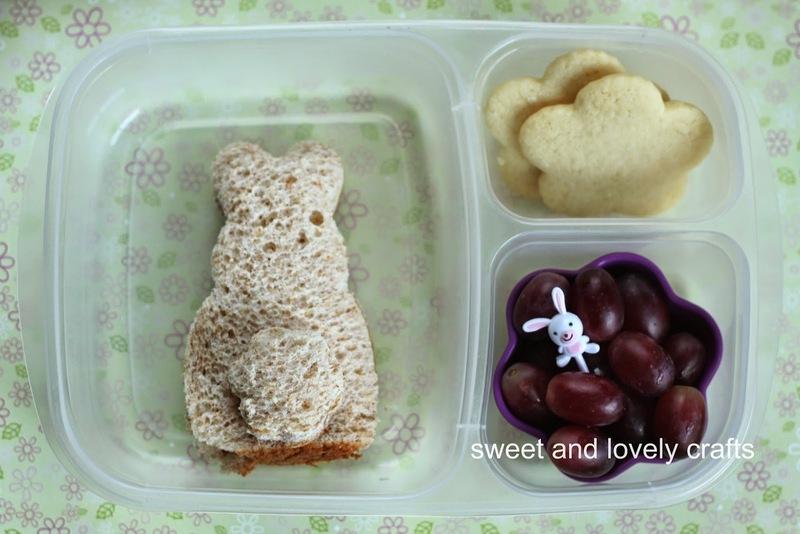 I added in a few grapes and bunny pick, some sugar cookies we made and a green apple. More Wowbutter sandwiches cut into small flowers. 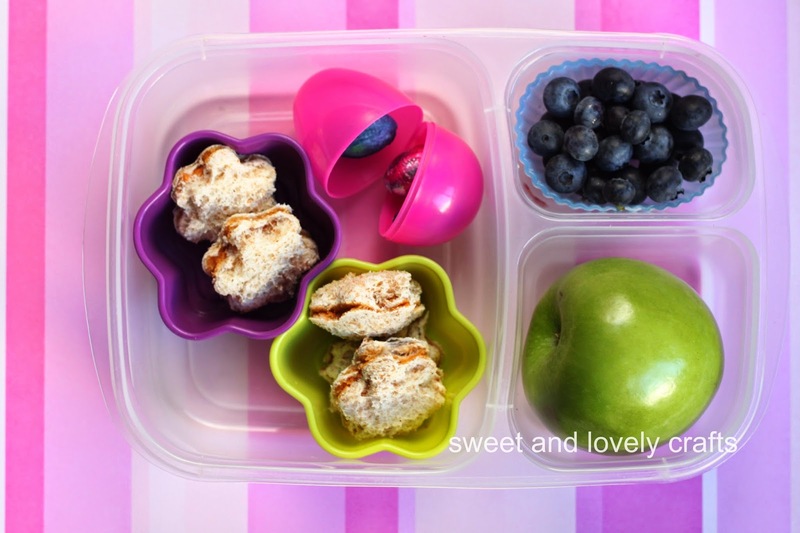 An apple, some blueberries and a few chocolate Easter eggs in a pink plastic egg. This was her favorite lunch! 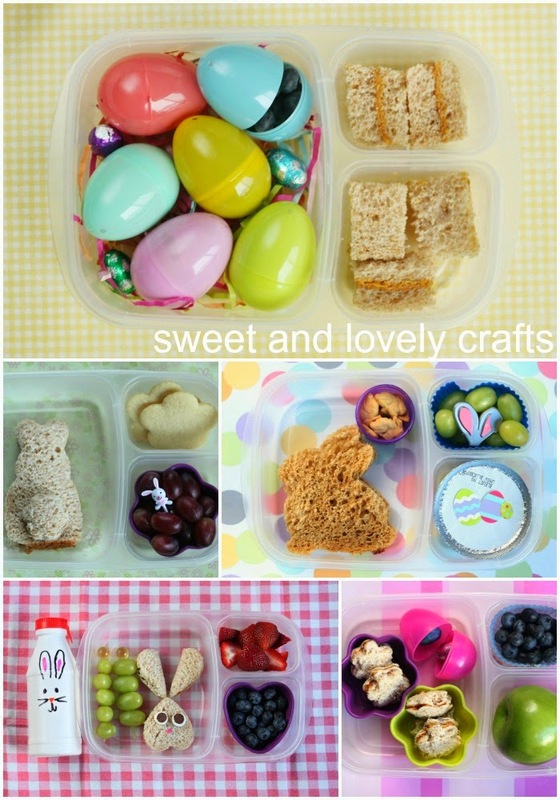 The plastic eggs were filled with strawberries, blueberries, grapes and Annie's crackers. I cut her sandwich into small pieces and added them in the smaller compartments. I put a few chocolate eggs in there as well. 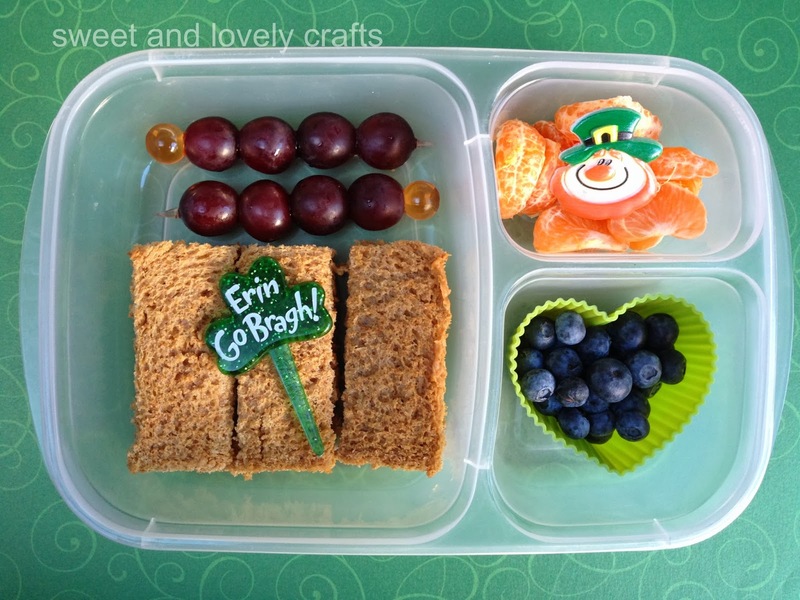 These lunches, along with all of my other ones, are packed in the fabulous EasyLunch Box containers that we love. 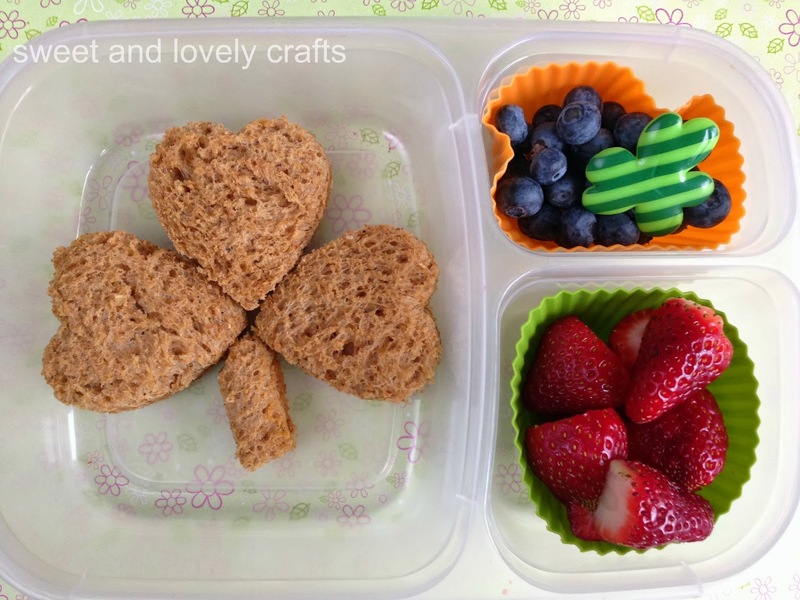 I used some shamrock cookie cutters to make shamrock sandwiches. I added some green grapes and strawberries. As a treat I added in a few chocolates. I ordered a few things from All Things For Sale a little while ago. It was hard to contain myself on that site. There are so many fun things! 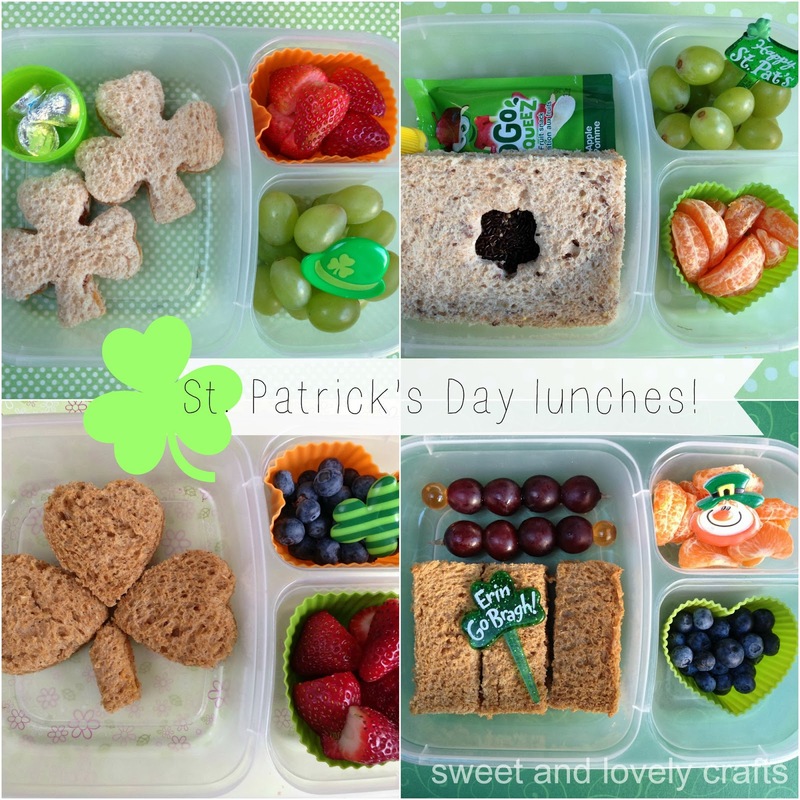 I ordered some St. Patrick's Day picks, and added one into each of these lunches. Ha. Now this lunch didn't quite turn out as I had pictured it in my head. For some reason St. Patrick's Day stuff is so hard to find this year. I searched all over Halifax for a small shamrock cookie cutter and couldn't find one anywhere. The one that I used above is actually an apple that I used upside down (not that it looks much like an apple either!) I filled the cut out with some chocolate sprinkles. I added an applesauce, clementine and some more green grapes. And of course another one of my new picks. I used a medium sized cookie cutter and cut three hearts out of 1 sandwich. There was a tiny bit leftover to make the stem of the shamrock. 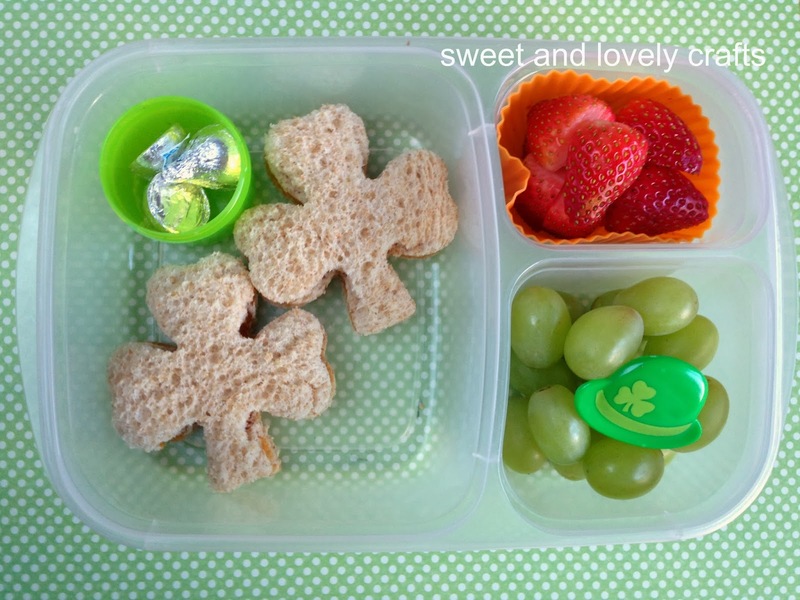 Blueberries and strawberries and a little shamrock ring finished off this lunch. I cut the sandwich into three slices (like the Irish flag), not that it was noticed by Claire! I skewered some grapes and added a clementine and blueberries. I used one of my new picks and a little leprechaun ring. 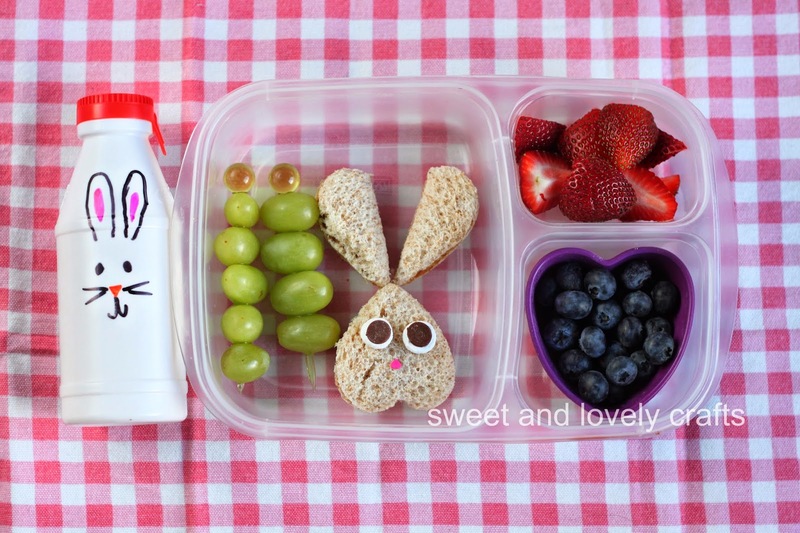 Love these lunch boxes? I sure do. 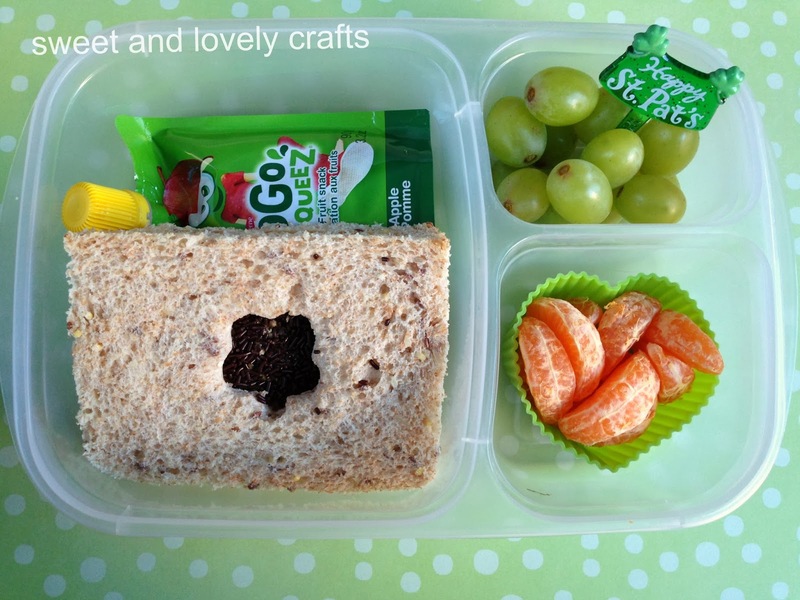 You can check them out here: EasyLunch Boxes. 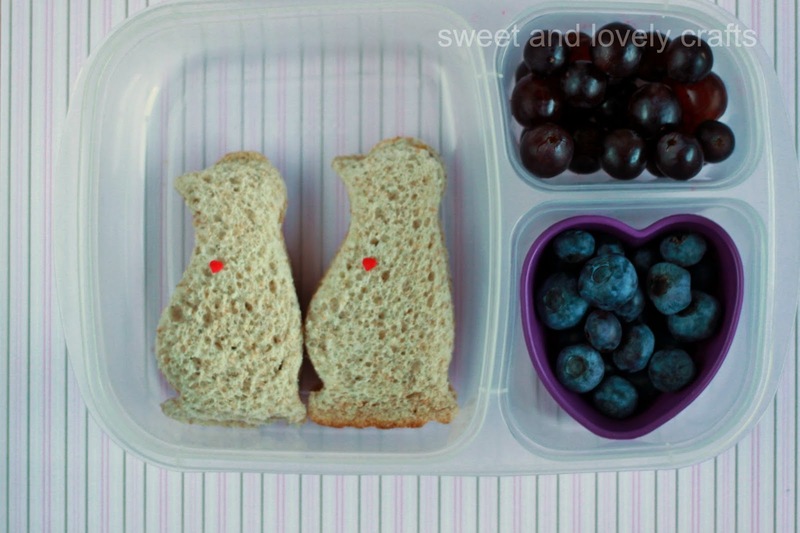 They make packing lunches so easy! 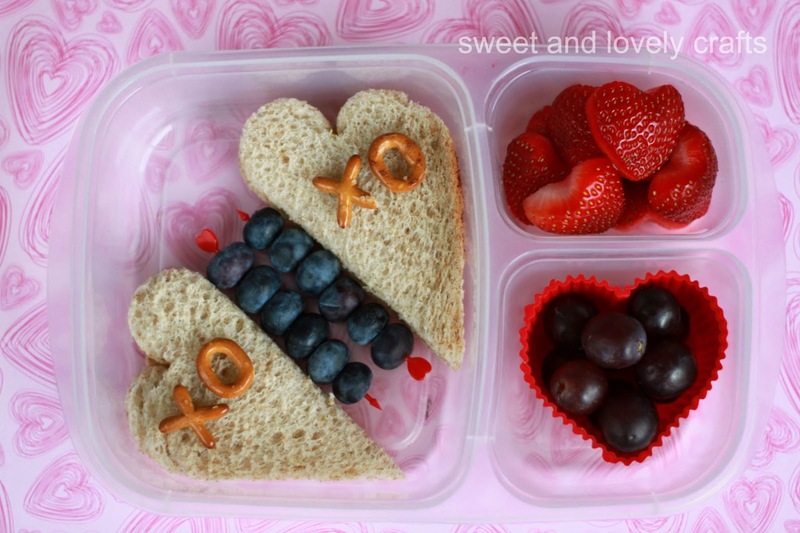 I love making valentines lunches. Oh wait, I just love packing lunches in general. All of these are packed in my EasyLunch Box containers. They make packing lunch SO easy. I cut Claire's sandwich into two hearts using a sandwich cutter that I picked up at the grocery store. I added a few pretzels to the top of the sandwiches. I skewered some blueberries on heart (cocktail) skewers. I added a few grapes to a silicone cup and added some heart shaped strawberries. I used a penguin cutter to cut Claire's sandwich into penguins. I added a heart sprinkle to each penguin. Using a heart silicone container I gave Claire some blueberries and grapes. 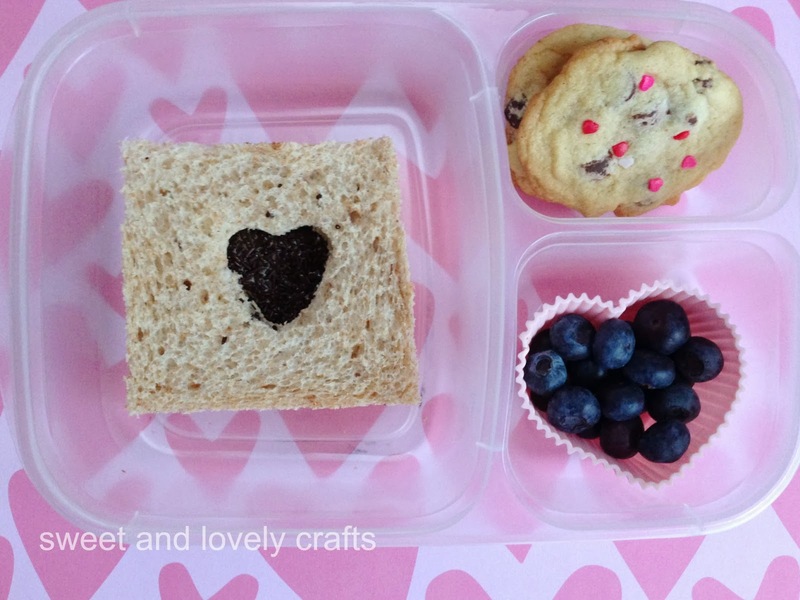 Claire was asking me to add some sprinkles to her lunch, so I cut off the crusts of her sandwich and used a small heart cookie cutter to cut a heart out of one piece of bread. I made the sandwich using WOWbutter. After I put the sandwich together I added some chocolate sprinkles through the heart piece. I packed some more blueberries in a silicone cup and added in a few chocolate chip cookies for a snack. I also added in an applesauce. 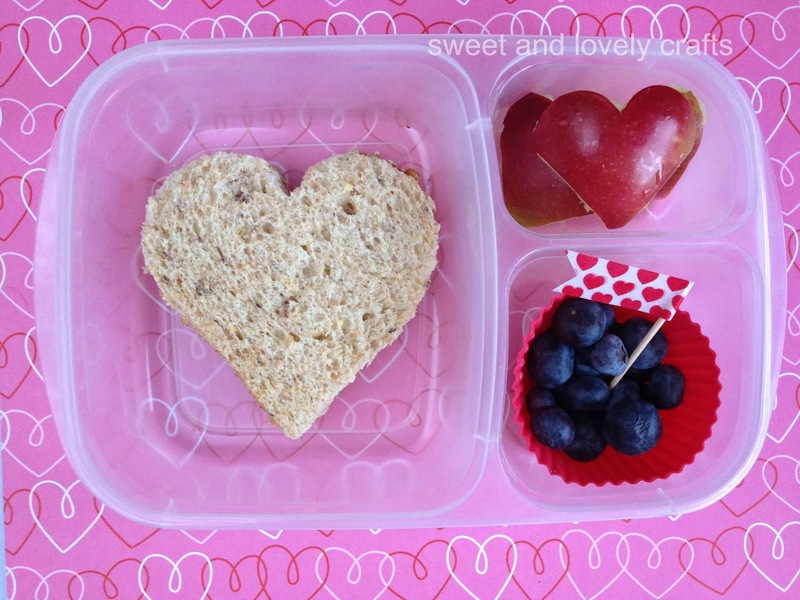 I cut her sandwich in the shape of a heart, as well as the apples :) I used a bit of washi tape to make a little skewer flag for her cup of blueberries. In years past, I've made a lot of different Valentine bookmarks with them. Last year we did a fruit themed series and the previous year we made some animal themed ones. This year, Simon and I made some train themed ones, after his favorite show, of course! 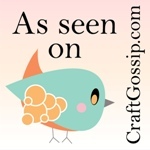 It can be tricky to find or make Valentines that aren't made of pink and purple hearts and covered with lace glitter. I tried to incorporate Simon's interests to make these bookmarks. If you watch the Thomas show at all, I hope that you can recognize all of these trains! The ones in the above picture are Charlie, Thomas, James and Percy. The trains below are Gordon, Duncan and Henry. These are so simple to make. Start by cutting a piece of white paper into 6x2" pieces. 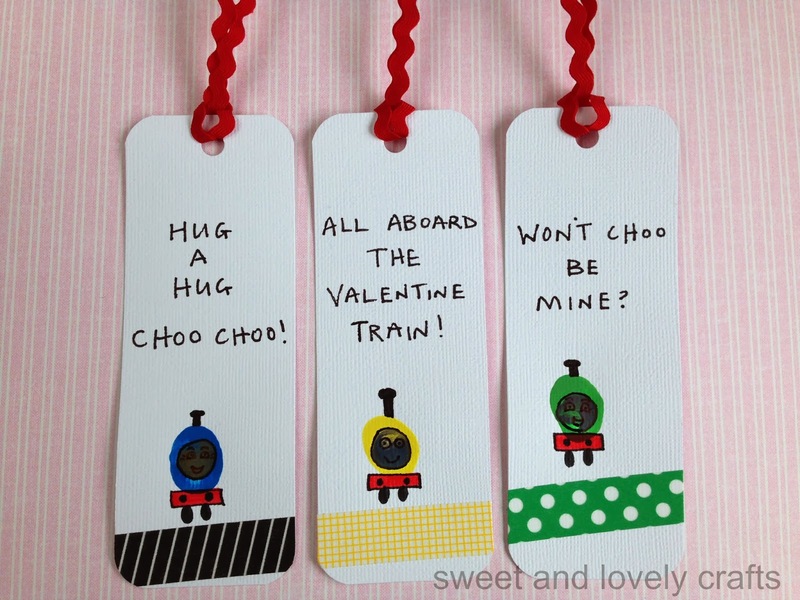 Decide what trains you'd like to make and have your child stamp their finger in the paint and then onto the paper. 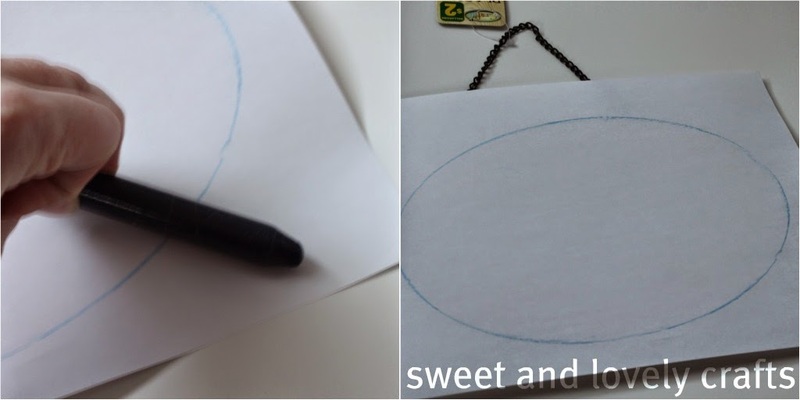 Once all of the colored dots have dried, have your child stamp their pointer finger into some grey paint and then onto the center of the colored dot. Once that paint is dry use a thin black marker to decorate the train's face. Don't forget to add the funnel, buffer (use a red marker) and some wheels. I added a bit of washi tape to the bookmarks because I love it. And have to start using my hoard collection of tape. If you have any questions about the bookmarks leave it in the comments and I will get back to you! I love Christmas crafting. Surprise! This is one of my favorite crafts because one footprint is Claire's and one is Simon's. I love that the project incorporated both of them on the same paper. To make the Santa, I paint the heel of Claire's foot cream colour and the rest of her foot red. Then I painted Simon's foot brown and stamped it next to Claire's footprint. 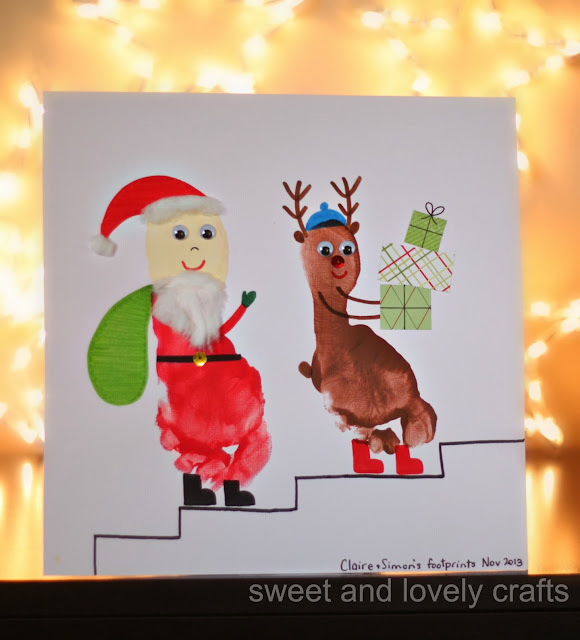 Note: When you're doing this try to make sure you line up the toes of the footprints, otherwise you'll end up making stairs for Santa and the reindeer to walk up :) After I stamp their feet on the paper I have a face cloth right next to me to wipe the paint off of their feet. I always use Crayola paints and it wipes right off. We usually head up for a bath shortly after these projects so that I don't have to worry about getting all of the paint out in between their toes. For Santa, I used a black marker to drawn Santa's boots, belt and nose. I used a red marker to draw Santa's hat, smile and arm. I drew his mitten and toy bag with green markers. I glued a sequin on Santa's belt and added some googly eyes. Then I ripped apart a cotton ball to make Santa's beard, the fur on the top of the hat and the ball on the end of the hat.